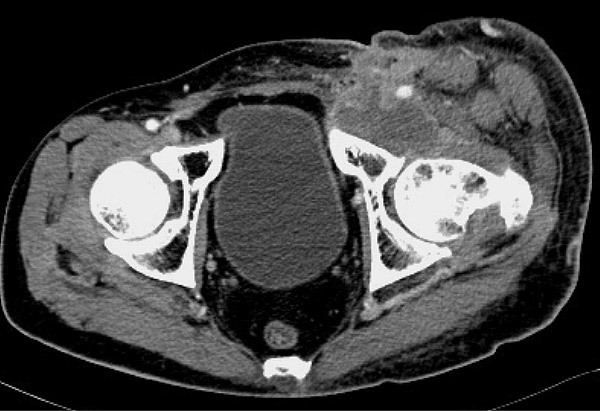 A 45-year-old man presented with a 2-week history of fever, left inguinal pain, and leg swelling. He had had rectal resection for adenocarcinoma 1 year earlier and, just 1 month before, left inguinal lymphadenectomy for a nodal metastasis. Soft tissue ultrasonography revealed the presence of an inguinal fluid collection. Contrast-enhanced MDCT of the abdomen and pelvis was performed to characterize the fluid collection and evaluate the proximal leg region.